I finally succumbed to the lure of of the Sunset Moth. This specimen was purchased as Urania ripheus, though Wikipedia has it as Chrysiridia rhipheus. 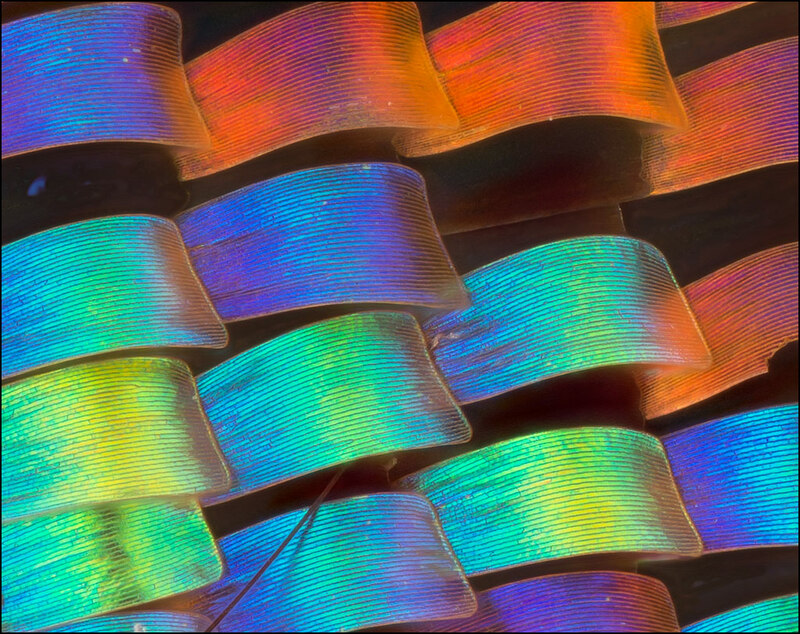 Regardless of what it's called, the species has striking colors and interesting morphology. All the images here are from a single stack, shot at full resolution (36 megapixels) on Nikon D800E using Mitutoyo M Plan Apo 10X NA 0.28 with a Raynox DCR-150 at infinity focus as tube lens. This detail is about 80% of actual pixels. Below is another detail, this time rotated 90 degrees to match the stereo that appears following the detail. Both this detail and the one above include a hair that passes under a scale. But the appearance is very different. In the detail above, the scale is effectively opaque, completely hiding the dark hair that passes under it. In the detail below, just right of image center, one bit of scale that passes over the light hair appears almost transparent. My first thought was that this was just the dreaded "transparent foreground artifact", and certainly there's lots of that elsewhere in the image. But no, in this particular case the hair really does go under the scale. Careful examination of the original frames confirms this, and the stereo view also makes the situation clear. Here is a small version of the entire frame. The first crop is roughly at the lower-left "thirds" point. The second crop is just above image center. Additional technical info: Camera at ISO 100, 1/250 second. Focus step 4 microns using StackShot, 150 frames. Dual flash from left/right, Canon 580EX II and Yongnuo Yn-460ii, each at 1/32 power, through 4 layers of Kleenex tissue. Shot as raw, processed through Lightroom using 16-bit workflow. 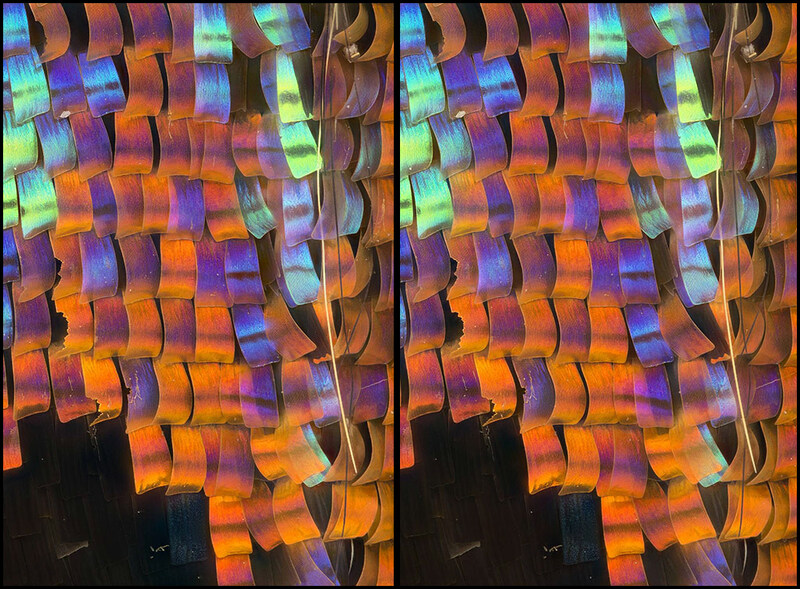 Images shown are from Zerene Stacker, mostly DMap, some retouching from PMax especially around the hairs. Welcome to the Sunset Moth Club, Rik. Excellent shots and very nice magnification. The first two crops are stunning and the three hairs gives the stereo extra depth. Did you secretly switch to Nikon ? > Excellent shots and very nice magnification. Thanks, Fred. 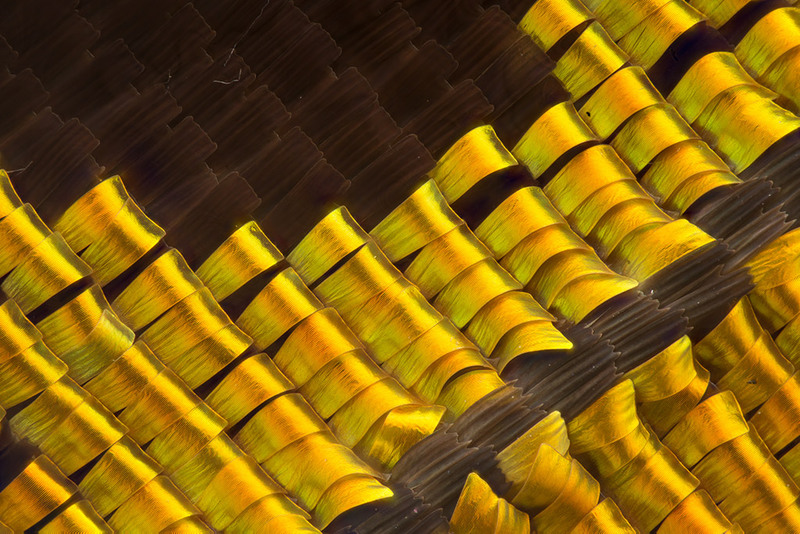 I was impressed that a mere 10X objective could see so much interesting detail on those scales. 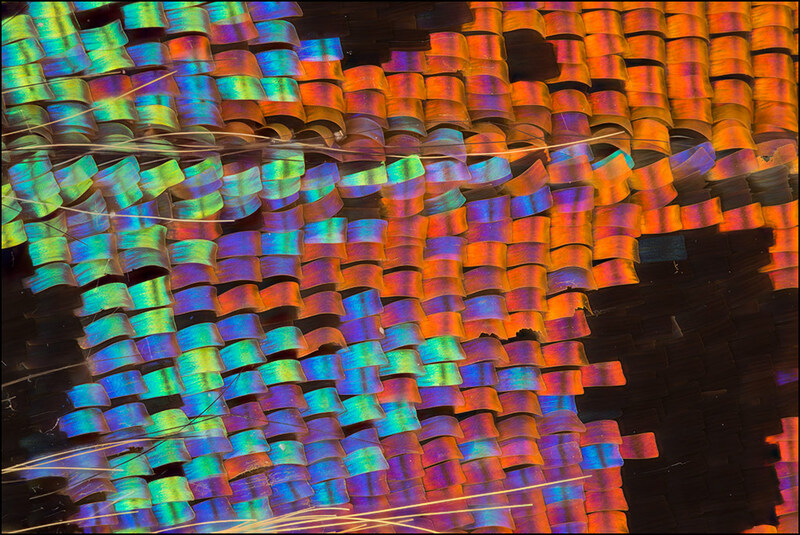 There's much more to see than with the moth scales that I usually use. But much more dependent on the lighting, too! > the three hairs gives the stereo extra depth. I must wryly admit that when I unpacked the specimen I found several more hairs in what might have been even better positions to show off the transparency. But at the time they seemed "just debris" from the packaging and shipping process, and so I painstakingly removed them using forceps and needles under a 20X microscope. In retrospect, I wish I had left a couple! > Did you secretly switch to Nikon ? "Switch" would be way too strong. I had a lot of reasons for buying the D800E, but dissatisfaction with Canon was not among them. It's more like I got tired of answering questions about full-frame based on other people's experiences, so I wanted a full frame to work with myself. Then I wanted as much sharpness as I could get, plus enough pixels that I could do a single lens test and get a pretty good idea of APS-C performance along with full frame. That combination didn't leave any options other than the D800E, so I finally bought one. The timing was nearly flawless, since only two months later the D810 was announced. Oh well, the D800E will still do what I bought it for. The D800E is presenting an interesting learning experience on many fronts. As I've explained it to other people, "The Quick Start Guide is 52 pages; the User's Manual is 447 pages; the book I bought to explain what's omitted from the manual is 862 pages. None of them cover much of what I care about. Surely I need never fear Alzheimer's..."
But simply because I don't know very well how to use it, I'm making myself do that whenever possible. Along the way it's stressing other parts of my hardware and software, so that's a good thing too. No pain, no gain, and all that. I wonder what chewed up those scales on yours? I've never seen anything like that on my specimen. Seriously everyone into stacking should have one of these beauties! Btw lovely detail in those crops! I look forward to seeing what a good 20x or 40x objective can do on that sensor with that subject! 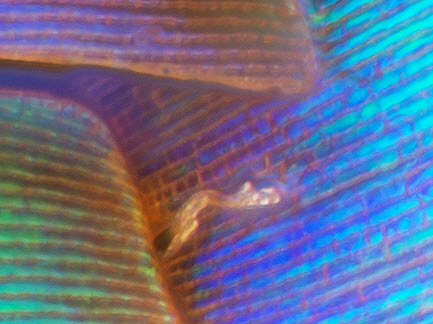 I was impressed that a mere 10X objective could see so much interesting detail on those scales. I must admit I could not believe that the first shot was done with 10X. 40X I would have believed. The D800E is presenting an interesting learning experience on many fronts. I sometimes operate a Nikon at work, but - as a faithfull Canonian- everything seems to go backwards, starting with the lensmount. I can imagine it took some time to getting used to. Impressive DxOmark values, however. It really shows in the first shot. I have no idea. It's very unusual and caught my attention right off when I scanned the specimen for an interesting area to shoot. All of the chewed-up scales I could find are in one small area. Since that area also had a striking range of bold colors, plus some interesting 3D structure, the choice was clear. I tried re-shooting this area with my Mitutoyo 50X, but I wasn't very happy with the result. Because of the utilized-aperture issue, this very shiny subject "squirms around" something awful as focus changes. Here's a short animation to illustrate that effect (50%, every other frame with 1 micron steps), plus what DMap was able to put together from it. 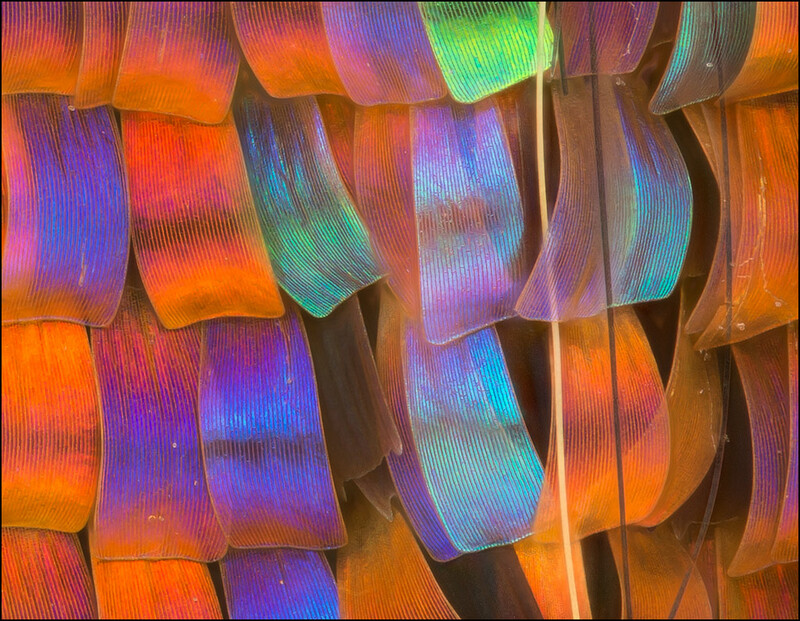 That issue aside, I'm working on another image that I'm happier with -- 20X of the gold scales. Here are the 20X images. The stereo is all PMax; the others are DMap retouched from PMax. I wonder what chewed up those scales on yours? The golden stack is absolutely beautiful.. love it! I remember Nikola has done some stacking at 50X.. & the result looks superb to me. Now I think about it, I really doubt that I can get such sharpness at 20X with my Nikon body. Seeing your results, I can somehow confirm it's not the cam's mistake as much as it looks it is mine! Nikola's result looks great to me too. 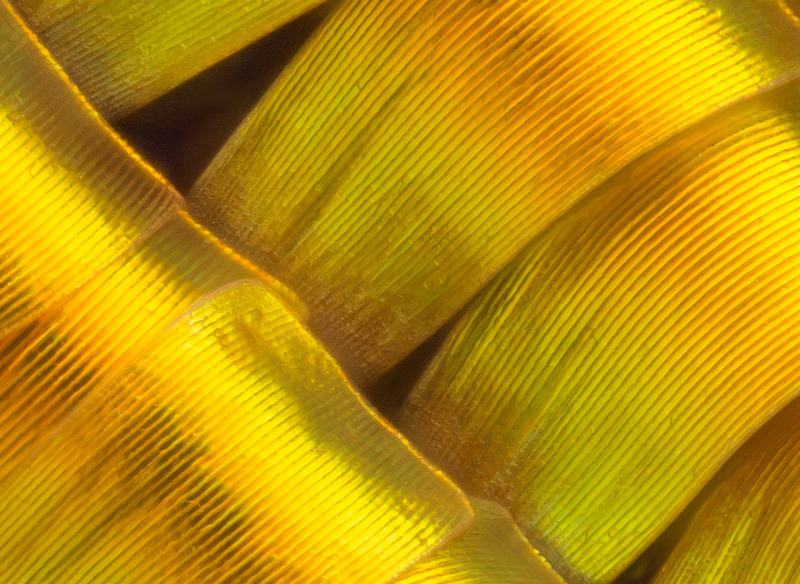 I shot the golden scales at 50X also, but I didn't like the result as much as at 20X. 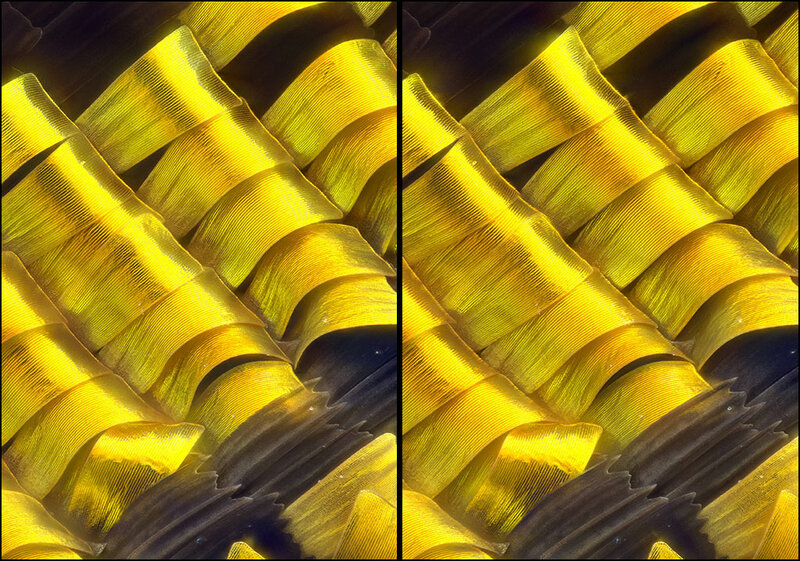 The resolution on subject was not much better (NA 0.55 versus NA 0.42, ratio 1.3:1), while the field of view was much smaller (50X versus 20X, ratio 2.5:1). As a result the image looked much less sharp. Also I was not able to get as good illumination because of the shorter working distance (13 mm versus 20 mm). All told it just didn't have the same impact. If you choose a shorter stack steps, we do not see more details, but the edges and lines are clear and after image processing is the image clearer! I use multiple flash units with reduced power so that the flash duration is as short as possible. This reduces the risk of blur. I think this are the crucial points. Very nice set, my favorite is #1.